The southwestern tip of Isle au Haut has the most dramatic and inspiring scenery on the entire island. 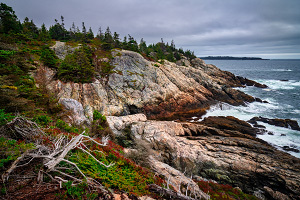 While two named trails, the Cliff Trail and Western Head Trail, loop around Western Head, for all intents and purposes, they are one continuous hike that allows tourists to wander up and down the cliffs and rocky beaches to take in the rugged ocean views. 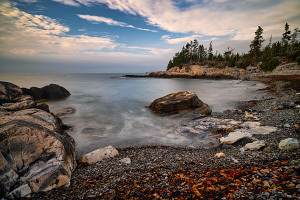 At the southern end of this hike is a short spur trail to a rocky beach that looks across to Western Ear, a nearby island that is just out of reach without swimming. If your time on Isle au Haut is limited, this loop hike is the one hike to do! 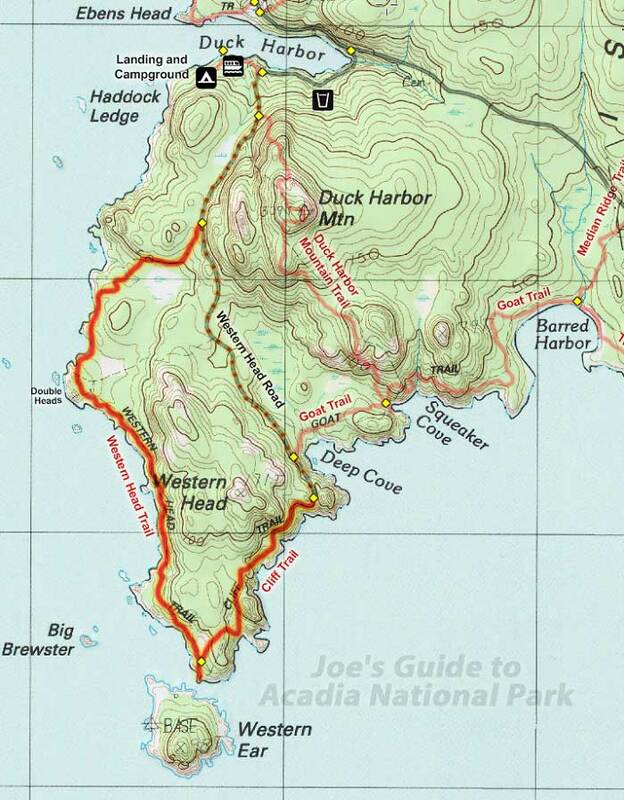 The most likely starting point for this hike is Duck Harbor, the spot where the Isle au Haut mailboat drops off and picks up tourists onto the island within Acadia National Park. The loop hike along the southwestern coastline around Western Head is the perfect activity for daytrippers looking to see the most dramatic scenery during their limited time on the island. 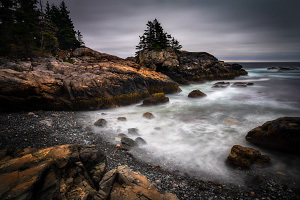 From the Duck Harbor boat landing and campground, head east to the Western Head Road and then hike the road south through the pleasant forested scenery. After roughly 1.3 miles along the road, you will pass the pleasant Deep Cove on the left (east) and will reach the cliffs above the southern coast of Isle au Haut. A prominent sign at the end of the road marks the start of the Cliff Trail. The Cliff Trail doesn't waste any time getting interesting; it heads up a set of wooden steps and wanders southwest along the rocky coastline, offering wonderful area views at the highpoints (be sure to look behind you to catch all of the views!) and access to several coves and small rocky beaches at the lowpoints. A few of the walk-arounds wander into the lush forests that exist just beyond the edges of the bare granite formations. There are several spots where you can wander off of the trail and explore the rock formations but take extreme caution--you are in the remote wilderness and nobody is around to immediately help with any emergencies or injuries. Roughly a mile north of the southern tip is the unofficially-named "Double Heads" -- a pair of tall rocky outcroppings that you can scramble up to get good views to the north and south. After continuing north and crossing two more cobblestone beaches, the trail abruptly turns right (east) and heads through the forest back to Western Head Road. Continue north along the road to return to Duck Harbor. If you have time to do only one thing on Isle au Haut, do this hike! But make sure you keep track of time and do not miss the boat off of the island. While there isn't any significant elevation gain to this hike, the constant up and downs along with the cobblestone beach crossings make this hike a bit slower and more strenuous than the map may make it look.